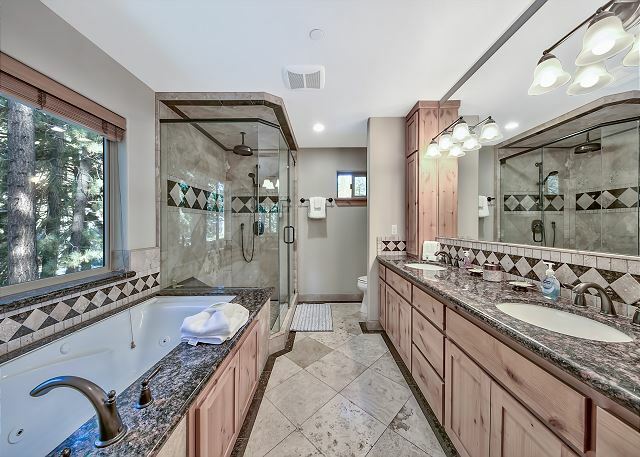 This beautiful home is located across the street from miles of Forest Service trails. It is in the perfect location for those who love outdoor adventures. Access to famous mountain biking trails, including Corral Trail, are just around the corner, and at the other end of the street there is access to miles of hiking trails! Cross country skiing, snowshoeing, and hiking are great winter options for the area. 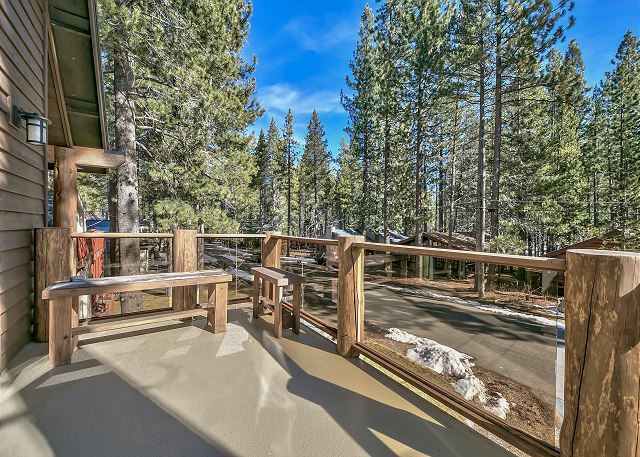 After a fun filled day exploring Lake Tahoe you are able to return to this peaceful cabin for a night of cooking and enjoying great company. The great room is accented by a gorgeous stone fireplace, wood floors, floor to ceiling windows, and a gourmet kitchen. The main floor (which is one floor up from the garage and main entrance) also includes the master suite, a second bedroom, and a half bath with laundry facilities. 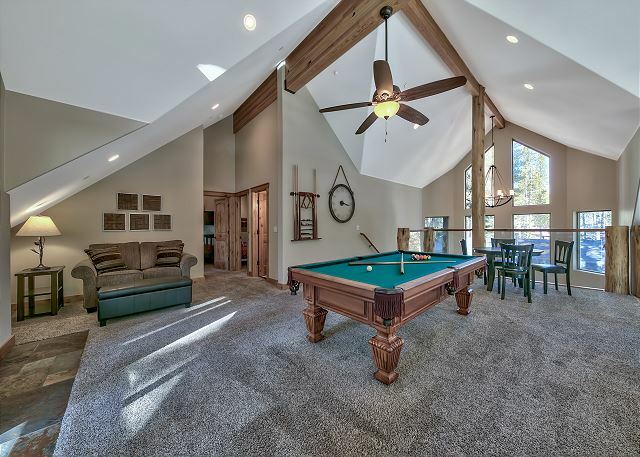 Upstairs is the game room loft with pool table, game table, and flat screen television. 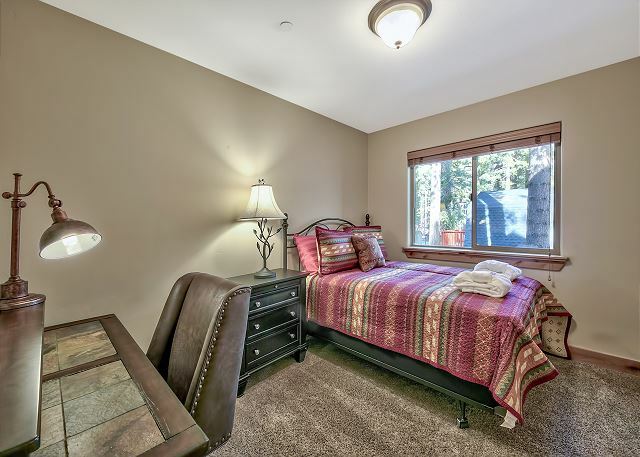 The guest bedrooms and a full bath are adjacent to the game room. 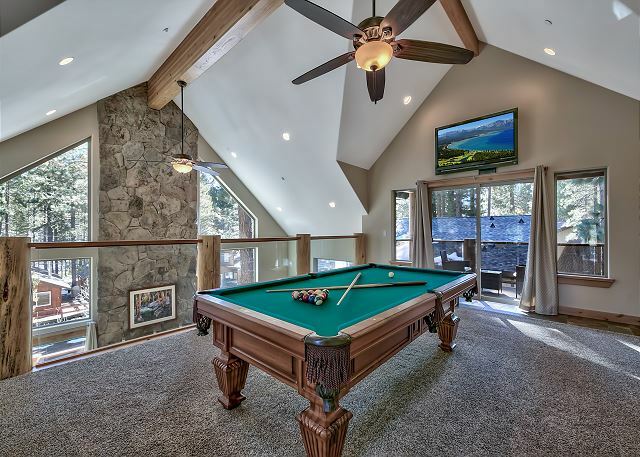 The Chibcha Lodge is the perfect spot for family and friends to gather and experience all the best Lake Tahoe has to offer. The small mountain community of Meyers is just a few minutes away, offering grocery shopping and small local restaurants. 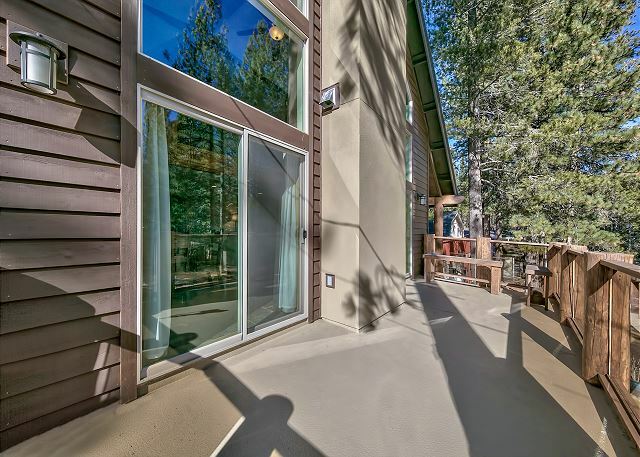 The amenities offered by South Lake Tahoe are just a few miles away as well, including restaurants, bars, shopping, beaches, and ski resorts! Enter through the front door into 2 story entry with natural stone floors and log accent stairway. The great room features a large flat screen TV, real wood fireplace, comfortable seating, and floor to ceiling windows. The dining area features a hand crafted dining table. 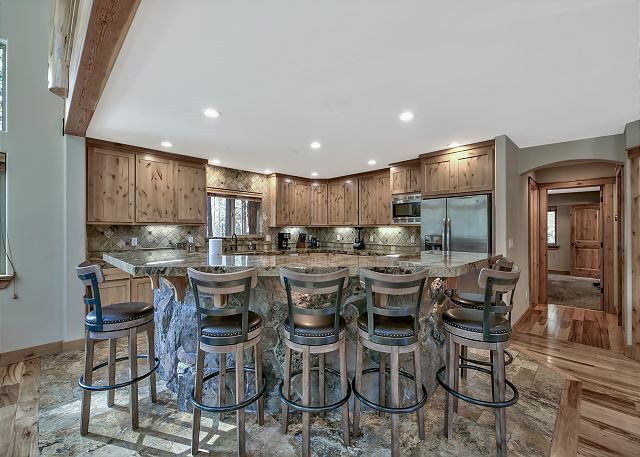 The chef's kitchen is anchored by the gas cook-top, expansive granite counters, and plenty of room for the family chefs to prepare meals. The front deck has a gas BBQ. Off the kitchen there is a half bath with laundry (washer and dryer). The first bedroom has a double bed. The master suite is located at the back of the house overlooking the backyard, the suite has a king bed, flat screen TV, and luxurious master bath separate tub and shower and two sinks. Upstairs is a spacious loft area with a pool table, flat screen TV, game table, and a comfortable couch. There is a covered outside sitting area. Bedroom 3 has two sturdy twin bunk beds. Bedroom 4 has a queen bed and a sturdy twin bunk bed. There is a full bath on this level. What a great home! Very spacious and clean when we arrived. Very modern compared to most older Tahoe homes but still has that mountain feel. Curious why the occupancy is for 10 when it has beds for 12 (3 bunk beds - sleeps 6, and 3 larger beds -could sleep 3 couples - 6 people). Nevertheless the location was nice, about 15 minute drive to casinos/lake. Met some of the neighbors who were friendly enough. We enjoyed use of the pool table upstairs and the beautifully designed kitchen. We all expressed that we wished this was our actual home! 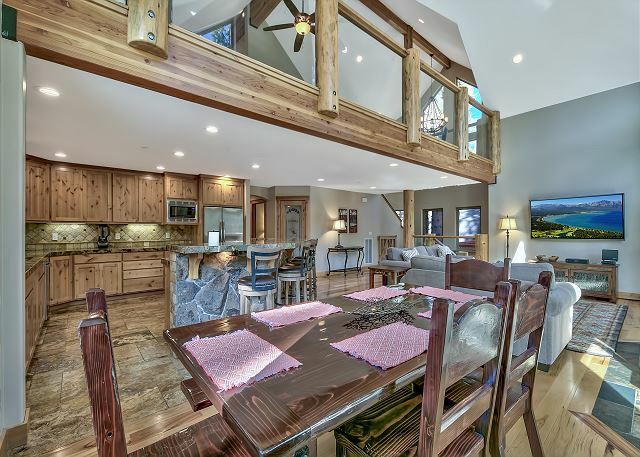 Stunning home in a fantastic location! This house is absolutely gorgeous with a spacious yard and right down the street from trails! Beds were comfortable and there’s a pool table for added entertainment. Kitchen supplies are very minimal- we didn’t even have garbage bags- so just be sure to bring what you need. Multiple large TV’s, beautiful deck to have your coffee on and with very friendly neighbors! The garage is absolutely huge as well. We had quite a bit of trouble getting the code to get in from the company which was kind of frustrating but it all worked out in the end. I would 100% stay here again! Thank you for the feedback, I will remind cleaners to leave garbage bags, that is on their check list. Great place at a very reasonable price. Other than there not being grass in the backyard everything was as pictured. Clean and easy check in and check out procedure. Would definitely recommend to those that don’t mind being 10 or so minutes from downtown. House was perfect!! Great house for a family with kids!! Jim H from Bakersfield, CA does not recommend this vacation rental. Before the trip even started, Pinnacle put us through a lot of stress. Pinnacle is very poorly run. I made a reservation last Aug. and I was informed that the original place was no longer available cause the owner went with another property manager. I was informed this 11 days before our trip! I even checked a month before, making sure that the house was still ours and that there weren't any problems cause they didn't take my final payment. They reassured me that the house is still ours and there weren't any issues. 11 days before the trip, Pinnacle told me that I can either get a refund or take another house that they have available. they only had 2 options for us, which was in different areas. needless to say, we spent a lot of time and effort planning things to do and assigning rooms for each family. Now, not only did we need to figure out things to do in a whole new area, we also had to figure out which family gets which room. And obviously if we took the refund, we would be paying a lot more for a different house, this late in the game. Long story short, great house, run by a bad company. I am so sorry we had to move you and for the confusion on our end. Overall, a very pleased renter. We stayed on site for three nights. The property is very well kept, clean, large three car tandem garage. All rooms were fair to good size rooms. Did have an issue with refrigerator not cooling stuff down the first night. I did call in and report some small issues with the home. I couldn’t get the TV in the living room to work, a fan blade was broken in the main bedroom causing an unbalanced rotation, upper level side door not properly closing. Was promised a call to fix the TV issue, no call back. But overall still pleased with the greatly designed home. I am so sorry our tech person did not reach you, he did tell us he tried to call, but sometimes cell service in the county is spotty. The ceiling fan is being replaced! It is not unusual for a refrigerator to take a while to cool down, especially if the house has sat empty for a while and then is filled with a lot of warm items, it takes a while to adjust. Thank you so much for the feedback we will work on these items. Amazing house, had a great stay! 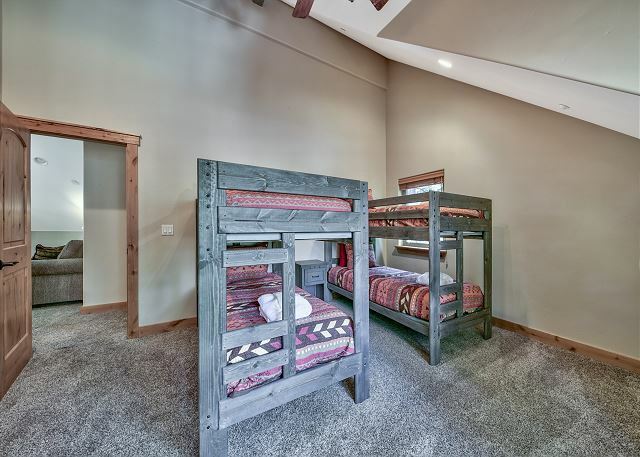 Great house, lots of beautiful details, spacious and enough beds with tons of bunk beds. House was very clean and in a perfect location. Thank you so much for the feedback, you were our first guest at this home!